Creates a painter on a given paint device. The painter class provides a vector graphics interface for painting. It needs to be used in conjunction with a WPaintDevice, onto which it paints. To start painting on a device, either pass the device through the constructor, or use begin(). A typical use is to instantiate a WPainter from within a specialized WPaintedWidget::paintEvent() implementation, to paint on the given paint device, but you can also use a painter to paint directly to a particular paint device of choice, for example to create SVG, PDF or PNG images (as resources). The painter maintains state such as the current pen, brush, font, shadow, transformation and clipping settings (see setClipping() and setClipPath()). A particular state can be saved using save() and later restored using restore(). The painting system distinguishes between device coordinates, logical coordinates, and local coordinates. The device coordinate system ranges from (0, 0) in the top left corner of the device, to (device->width().toPixels(), device->height().toPixels()) for the bottom right corner. The logical coordinate system defines a coordinate system that may be chosen independent of the geometry of the device, which is convenient to make abstraction of the actual device size. Finally, the current local coordinate system may be different from the logical coordinate system because of a transformation set (using translate(), rotate(), and scale()). Initially, the local coordinate system coincides with the logical coordinate system, which coincides with the device coordinate system. The device coordinates are defined in terms of pixels. Even though most underlying devices are actual vector graphics formats, when used in conjunction with a WPaintedWidget, these vector graphics are rendered by the browser onto a pixel-based canvas (like the rest of the user-interface). The coordinates are defined such that integer values correspond to an imaginary raster which separates the individual pixels, as in the figure below. 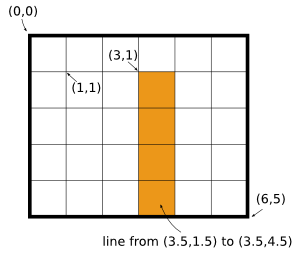 As a consequence, to avoid anti-aliasing effects when drawing straight lines of width one pixel, you will need to use vertices that indicate the middle of a pixel to get a crisp one-pixel wide line, as in the example figure. By setting a viewPort() and a window(), a viewPort transformation is defined which maps logical coordinates onto device coordinates. By changing the world transformation (using setWorldTransform(), or translate(), rotate(), scale() operations), it is defined how current local coordinates map onto logical coordinates. The painter provides support for clipping using an arbitrary path, but not that the WVmlImage paint device only has limited support for clipping. Before painting, you must invoke begin(WPaintDevice *) on a paint device. Begins painting on a paint device. Returns the brush style that is currently used for filling. The clip path is returned as it was defined: in the local coordinates at time of definition. Returns the combined transformation matrix. Returns the transformation matrix that maps coordinates to device coordinates. It is the combination of the current world transformation (which defines the transformation within the logical coordinate system) and the window/viewport transformation (which transforms logical coordinates to device coordinates). Returns the device on which this painter is active (or 0 if not active). Draws an arc using the current pen, and fills using the current brush. The arc is defined as a segment from an ellipse, which fits in the rectangle. The segment starts at startAngle, and spans an angle given by spanAngle. These angles have as unit 1/16th of a degree, and are measured counter-clockwise starting from the 3 o'clock position. This is an overloaded method for convenience. Draws an arc using the current pen, and connects start and end point with a line. The area is filled using the current brush. The arc is defined as a segment from an ellipse, which fits in the rectangle. The segment starts at startAngle, and spans an angle given by spanAngle. These angles have as unit 1/16th of a degree, and are measured counter-clockwise starting at 3 o'clock. Draws an ellipse using the current pen and fills it using the current brush. The ellipse is defined as being bounded by the rectangle. Draws the image so that the top left corner corresponds to point. This is an overloaded method provided for convenience. Draws part of an image. Draws the sourceRect rectangle from an image to the location point. Draws an image inside a rectangle. Draws the image inside rect (If necessary, the image is scaled to fit into the rectangle). Draws part of an image inside a rectangle. Draws the sourceRect rectangle from an image inside rect (If necessary, the image is scaled to fit into the rectangle). Draws the sourceRect rectangle with top left corner (sx, sy) and size sw x sh from an image to the location (x, y). Draws a line using the current pen. Draws a line defined by two points. Draws an array of lines. Draws the lineCount first lines from the given array of lines. Draws lineCount lines, where each line is specified using a begin and end point that are read from an array. Thus, the pointPairs array must have at least 2*lineCount points. Draws the lines given in the vector. Draws a number of lines that are specified by pairs of begin- and endpoints. The vector should hold a number of points that is a multiple of two. Draws and fills the given path using the current pen and brush. Draws an arc using the current pen, and connects start and end point with the center of the corresponding ellipse. The area is filled using the current brush. Draws a single point using the current pen. This is implemented by drawing a very short line, centered around the given position. To get the result of a single point, you should use a pen with a Wt::SquareCap or Wt::RoundCap pen cap style. Draws a number of points. Draws the pointCount first points from the given array of points. Draws a polygon that is specified by a list of points, using the current pen. The polygon is closed by connecting the last point with the first point, and filled using the current brush. Draws a polyline that is specified by a list of points, using the current pen. Draws and fills a rectangle using the current pen and brush. Draws a number of rectangles. Draws and fills the rectCount first rectangles from the given array, using the current pen and brush. Draws and fills a list of rectangles using the current pen and brush. Draws a WPainterPath on every anchor point of a path. If one of the anchor points of the path is outside of the current clipping area, the stencil will be drawn if softClipping is disabled, and it will not be drawn when softClipping is enabled. Draws text using inside the rectangle, using the current font. The text is aligned inside the rectangle following alignment indications given in flags. The text is drawn using the current transformation, pen color (pen()) and font settings (font()). AlignmentFlags is the logical OR of a horizontal and vertical alignment. Horizontal alignment may be one of AlignLeft, AlignCenter, or AlignRight. Vertical alignment is one of AlignTop, AlignMiddle or AlignBottom. TextFlag determines how the text is rendered in the rectangle. Text can be rendered on one line or by wrapping the words within the rectangle. If a clipPoint is provided, the text will not be drawn if the point is outside of the clipPath(). If the clip path is not a polygon, i.e. it has rounded segments in it, an approximation will be used instead by having the polygon pass through the control points, and the begin and end point of arcs. HtmlCanvas: on older browsers implementing Html5 canvas, text will be rendered horizontally (unaffected by rotation and unaffected by the scaling component of the transformation matrix). In that case, text is overlayed on top of painted shapes (in DOM div's), and is not covered by shapes that are painted after the text. Use the SVG and VML renderers (WPaintedWidget::inlineSvgVml) for the most accurate font rendering. Native HTML5 text rendering is supported on Firefox3+, Chrome2+ and Safari4+. TextWordWrap: using the TextWordWrap TextFlag is currently only supported by the SVG backend. The code generated by the SVG backend uses features currently only supported by Inkscape. Inkscape currently supports only Top vertical alignments. This is an overloaded method for convenience, it will render text on a single line. This method is called automatically from the destructor. Like drawPath(const WPainterPath&), but does not stroke the path, and fills the path with the given brush. Like drawRect(const WRectF&), but does not stroke the rect, and fills the rect with the given brush. Returns the font that is currently used for rendering text. The default font is a 10pt sans serif font. Returns whether clipping is enabled. Clipping support is limited for the VML renderer. Returns whether this painter is active on a paint device. Returns the pen that is currently used for stroking. Returns the current render hints. Returns the logical OR of render hints currently set. Resets the current transformation to the identity transformation matrix, so that the logical coordinate system coincides with the device coordinate system. Returns the last save state. Pops the last saved state from the state stack. Rotates the logical coordinate system. Rotates the logical coordinate system around its origin. The angle is specified in degrees, and positive values are clock-wise. A copy of the current state is saved on a stack. This state will may later be restored by popping this state from the stack using restore(). The state that is saved is the current pen, brush, font, shadow, transformation and clipping settings (see setClipping() and setClipPath()). Scales the logical coordinate system. Scales the logical coordinate system around its origin, by a factor in the X and Y directions. Changes the fills style for subsequent draw operations. Sets the path that is used for clipping subsequent drawing operations. The clip path is only used when clipping is enabled using setClipping(bool). The path is specified in local coordinates. Enables are disables clipping for subsequent operations using the current clip path set using setClipPath(). Clipping support is limited for the VML renderer. Only clipping with a rectangle is supported for the VML renderer (see WPainterPath::addRect()). The rectangle must, after applying the combined transformation system, be aligned with the window. Changes the font for subsequent text rendering. Note that only font sizes that are defined as an explicit size (see WFont::FixedSize) will render correctly in all devices (SVG, VML, and HtmlCanvas). Careful, for a font family that contains a space, you need to add quotes, to WFont::setFamily() e.g. Changes the pen used for stroking subsequent draw operations. Renderers may ignore particular hints for which they have no support. The shadow effect is applied to all things drawn (paths, text and images). With the VML backend (IE), the shadow is not applied to images, and the shadow color is always black; only the opacity (alpha) channel is taken into account. Selects the part of the device that will correspond to the logical coordinate system. By default, the viewport spans the entire device: it is the rectangle (0, 0) to (device->width(), device->height()). The window defines how the viewport is mapped to logical coordinates. Defines the viewport rectangle in logical coordinates, and thus how logical coordinates map onto the viewPort. By default, is (0, 0) to (device->width(), device->height()). Thus, the default window and viewport leave logical coordinates identical to device coordinates. Sets a transformation for the logical coordinate system. Sets a new transformation which transforms logical coordinates to device coordinates. When combine is true, the transformation is combined with the current world transformation matrix. Returns the current shadow effect. Like drawPath(const WPainterPath&), but does not fill the path, and strokes the path with the given pen. Translates the origin of the logical coordinate system. Translates the origin of the logical coordinate system to a new location relative to the current logical coordinate system. Translates the origin of the logical coordinate system to a new location relative to the logical coordinate system. Returns the current world transformation matrix.